There is barely anyone who is not excited about discovering the unique destinations of the world. Some travel enthusiasts prefer visiting multiple countries in one trip itself, while some choose one destination and explore its hidden beauty in-depth. Whether you are off to holidays or off to a business trip, one of the most the essential parts of your trip is managing foreign exchange. It is advised to buy forex in advance to avoid any last minute hassles. Some people prefer foreign currency, while some trust travel prepaid cards, depending on their usage, and itinerary. Prepaid travel cards are secure and easy, making them a preferred choice for many travelers. Do you still personally visit various forex centers around your locality to find the best rates? Stay safe from inflated exchange rates and unreliable vendors. Buy your forex online from Thomas Cook, one of the world’s most trusted foreign exchange partners. If you plan to visit multiple countries, then it only makes sense to opt for a forex travel card as it eliminates the hassle of carrying separate foreign currency of each country. Read our blog to understand the benefits and uses of Thomas Cook Forex Travel. Read our blogs for the Importance Of Carrying Forex Prepaid Card While Traveling Overseas. Our Borderless Prepaid Multicurrency Card is a smart card card that takes care of all your forex needs. It is a simple card that effortlessly fits in your pocket and empowers you to shop and explore like an avid traveler. No matter which country you are in, use this single prepaid forex card to splurge and pamper yourself, as well as withdraw money from ATMs. The best part is that you can buy the travel forex prepaid card from the convenience of your home. To further enhance your experience of booking forex, , we offer doorstep delivery of your card. Alternatively, you could also pick it up yourself from the nearest Thomas Cook branch. To get your travel card , just log on to the Thomas Cook website, enter the required details and you are good to go! Our One Currency Card safeguards you from inflated and hefty currency conversion charges. Traveling abroad can be an expensive affair and everyone makes the best attempt to reduce their travel costs by finding the best deals on hotels and flights. How about saving money on foreign exchange too? Thomas Cook along with MasterCard Worldwide has brought to you a cost-effective and efficient travel currency card that ensures a hassle-free trip. What’s more, this card empowers you to travel across countries and eliminate cross currency conversion charges, which typically range from 3% to 4% of the amount. Our collective years of expertise have enabled us to deliver world-class solutions, which in turn makes your trip a memorable one. Enhance your travel experience, while saving on forex by partnering with Thomas Cook. Read tips on how to plan an abroad trip effectively. Forex cards are prepaid cards, which can be used to make payments or withdraw cash in a foreign currency. You can use this card just like your debit card without linking it directly to your bank account. Forex cards also charge either zero or minimal transaction fees. Can I use a forex card to make purchases in India or online? As per FEMA regulations, Borderless Prepaid Cards and One Currency cards cannot be used in India, Nepal and Bhutan You cannot use it for online purchases where the website is registered in any of these 3 countries. Does a prepaid forex card get me better currency exchange rates? You get better exchange rates depending on the prevailing market rates and conditions. Prepaid forex cards let you load the funds in advance, allowing you to lock your conversion rate. Does a prepaid forex card have a validity period? Yes, a prepaid forex card has a validity period. 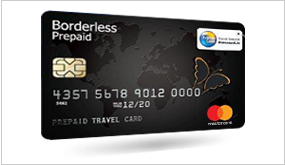 Thomas Cook’s Borderless Multi-Currency Card is valid for 5 years and One Currency Card is valid for 3 years. Do I have to pay any annual maintenance charges for my prepaid forex card? There are no annual maintenance charges for Thomas Cook’s prepaid cards. However, you will be charged an inactivity fee if you don’t conduct any transactions for six months. Will I have to buy a new prepaid forex card every time I travel abroad? You can use the same prepaid card depending on your currency needs. For instance, if your 2nd trip entails using dollars in the foreign country then you can reuse your One Currency Card. However, if you need to carry any other currency, you may have to purchase Borderless Prepaid Card, in case you don’t have it already. How can I buy a prepaid forex card from Thomas Cook? You can either visit any Thomas Cook branch or place an order online. Just select ‘Buy Forex Online’, choose your desired currency and amount. Enter all your details and choose delivery options. Make the payment and you are good to go! What are the documents that are needed to buy a prepaid forex card? Can I pay for my forex card with cash? Yes, you can pay for your forex card with cash at any Thomas Cook branch. What happens if I lose my forex card during my travel abroad? If you lose your forex card just walk into the nearest Thomas Cook branch and we’ll provide you with a new forex card, absolutely free of cost. Your money will remain safe as the card is chip and PIN protected. Can I load multiple foreign currencies in a single forex card? Yes, you can. With Thomas Cook’s Borderless Prepaid Card, you can load up to 8 currencies in a single forex card. Can I use my forex card to withdraw cash from ATMs when abroad? Yes, you can use your forex card at any ATM that accepts Master Card. What should I do if I forget the ATM PIN of my forex card? You can either log on to Thomas Cook’s website and change the pin or call up our 24/7 customer care assistance. When you use One Currency Card abroad, some merchants may give you an option of billing you in Indian Rupees versus billing you in the local currency. This concept of billing you in a different currency from that of the country you are travelling in is called Dynamic Currency Conversion (DCC). Are there any charges for ATM withdrawals and swiping at merchant establishments? With Thomas Cook’s cards you don’t have to pay any transaction fees at Thomas Cook’s All Point Network (APN) ATMs. You will be charged a transaction fee by the ATM’s bank only if you withdraw from an ATM which is not in Thomas Cook’s APN. At merchant establishments, you’ll be charged a currency conversion fee if you are paying in a currency other than your country’s currency.